Make no mistake, winter *is* coming. Just take a look at social media and you’ll see plenty of people complaining about the tumbling temperatures. Grumbling won’t make a difference though – it’s happening. So let’s be bold and face another brutal reality. How much money have you lost this year? Any small business that relies on filling appointments, suffers from empty slots, and some more than most. If your business has failed to fill just five appointments a month so far, you’re down 40 in total, and as we’ve already said winter is on the way. It doesn’t matter what you do, whether you run a small restaurant, cut hair or offer physiotherapy… if you don’t have a customer in front of you, you’re losing money. Each appointment (on average) brings business owners £60. So hands up… who’s looking at a £2,400 deficit (at the beginning of September)? Doesn’t make for comforting reading, does it? But hey, it won’t be long before the supermarkets have the Christmas decorations up (if they haven’t already), so let’s be a little more cheerful. We can help. And it only takes 6 seconds. What if you knew that you could reach your existing customers in 6 seconds? And not just any customers, but those who want to use your business over and over again. I’ll tell you what… I’ll repeat that. SIX SECONDS, to contact ALL your existing customers… at the same time. That’s what the me:now app does. You register your business and tell your customers to follow YOU. When you publish a free slot, every customer following you gets a notification on their phone. It takes a minute to do it the first time, and each time after that takes just six seconds. Want to know a secret? 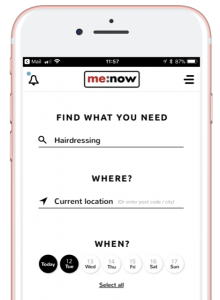 The me:now app is free to use 5 times a month. Now… who wants to earn on average an extra £3,600 a year by filling those appointments – for free? TELL YOUR CUSTOMERS TO FOLLOW YOU! ← How do you make an appointment fit into your hectic life? The me:now platform is a product of You Too Holdings Limited. You Too Holdings Limited is a company registered in England and Wales (No. 10149295).